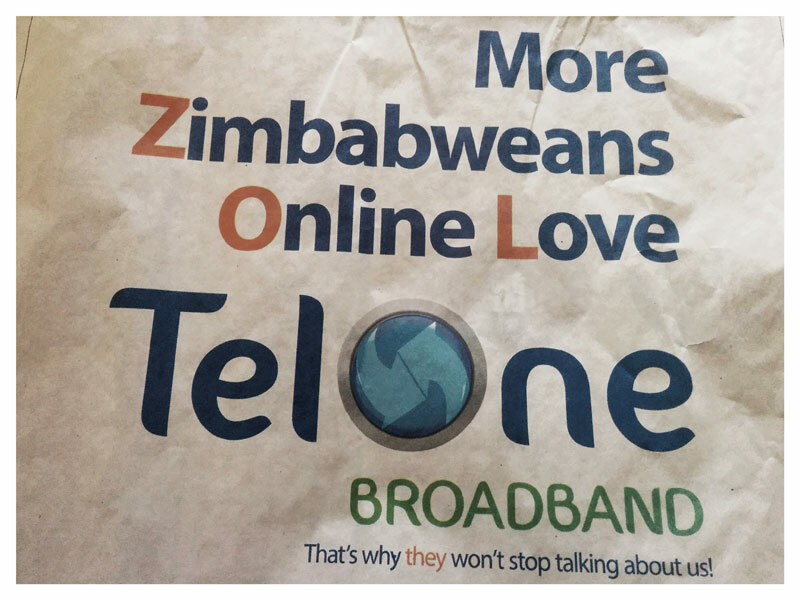 It’s always entertaining when companies cleverly use adverts to diss & make fun of each other, the ads by ZOL and TelOne in the past weeks (and today) were a welcome refreshment from daily Zim doom and gloom. We have our thoughts about which is cleverer but we’d love to hear what you think. Let us know in the comments? Which company killed it? 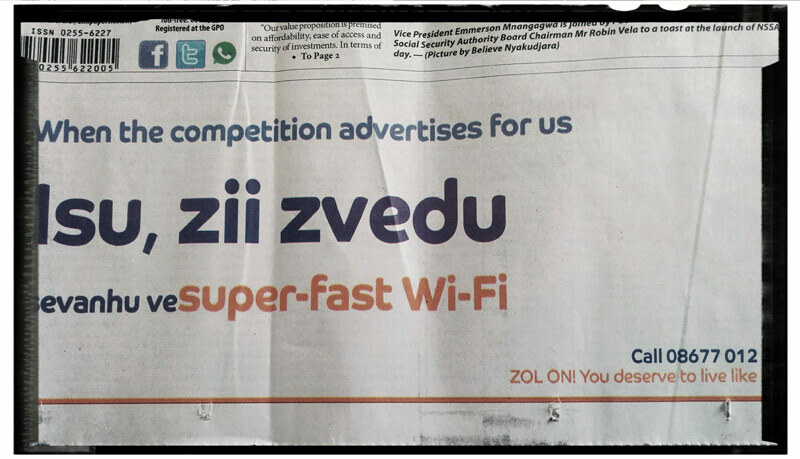 But ZOL just moved from clever thinking to just wasting advertising money and space on petty fighting. Their latest ad is not focused on how the ZOL experience is better, it’s just a jab at how ineffective TelOne’s ad was, which ironically takes away their ad’s effectiveness. Could have been creative with this without focusing on the obvious petty stuff. Me thinks we should let them entertain us some more before we say who killed it. Kudos for the witty adverts though. Rubbis we want reliable and affordable ads not wasstign money on por and hate adds. hahaha, you’re an unhappy customer clearly! Who did you wrong? 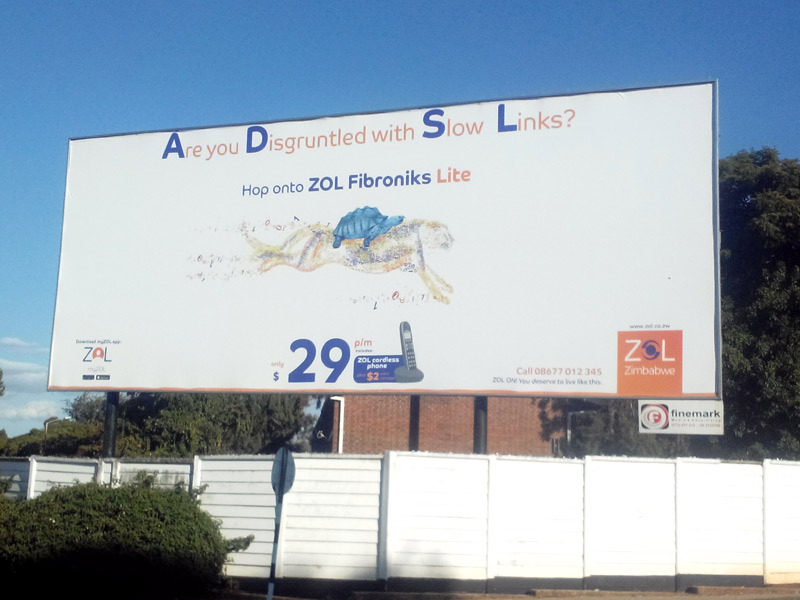 Billboard vs Press says it all.The other is just a reaction.Reactions are never witty.Unenge watofungirwa kudhara.Kudos to ZOL’s agency which I think in this case is Think Tank Advertising. Then vamwe avo,Jericho, chop chop next time lol. ZOL1-0 Telone . PS : Leicester won the league this way. Telone ad used too much of ZOLs colours, for moment ther i thot it was a ZOL ad. yakavhara mutambo and we know who won. After all this people will vote with their pockets! What matters at the end of day is who have the best reliable internet and customer service. And it’s ZOL that started this whole thing now they’ve gone Ray Charles to that fact. LOL let’s see how it unfolds. When internet providers react like they have become new models of Zim Dancehall beef, Stunner versus Mudiwa, Jaggers versus Makro, East Coast versus West Coast then know that we need to teach more marketing strategy rather than comical acts bent on increasing the cost of internet through balooning advertising costs. My take – each operator must focus on what VALUE they can give their customers. Adverts of this nature rarely cause customers to move. Sell benefits of your product as if noone else is competing with you. Zvihuta versus Nandos jibe is comedy – Leave that to PO Box and others. Compete on SERVICE, PRICE, QUALITY etc not on who has put on a better fight. Well said. It’s cute but will it get me to put my money there. In the case of one of these ISP’s their customer service is awful. They would be better placed applying resources there. That would sway me more than witticisms. Its good to have a little bit of jousting between competitors. As long as it does not become obnoxious, no problem. They both deserve to get bragging rights. Its entertaining. As for the service quality they are not that much different from each other and both their pricing regimes are atrocious compared to their colleagues down south. Both their advertising agencies deserve our kudos. Who has won – NO ONE has moved my heart to like their services. Which one is funnier – BOTH are creative ideas. We give it to both companies. Hillarious, but who won at the end of the day? The billboard erector was given it’s space and ran with the subscribers. ZOL are the winners. TELONE have essentially inadvertently advertised for ZOL. There is nothing in their advert that is against ZOL simply free viewing?